Our AW17 season clothing is carefully selected for style, comfort and affordability. Drawing from many of Britain’s top brands, we’re confident that every customer who comes to Apache will walk out with a stylish spring in their step. As the festive season approaches, you’ll need a smart outfit for certain events. With this in mind, we’ve dedicated this week’s blog to the essentials of a stylish, smart outfit — jackets, trousers, shirts and scarves — that you can customise to your heart’s content. Use the offer code OUTFIT17 at the online checkout for a 10% discount on all items! When we first laid eyes on Simon Templar gear at a recent trade show, we couldn’t believe the low price for such a high quality build. 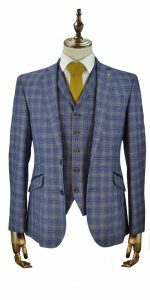 In the past 12 months our customers have fully embraced this new British brand, with their blazer jackets a particular favourite. 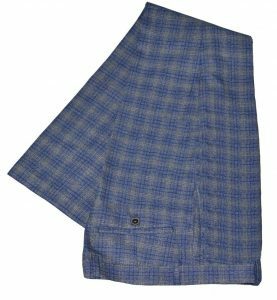 We’re delighted to offer the full outfit of Italian-style blazer and trousers for those special events when you need to look smart and stylish. The “Cedrik” style is new for AW17 season and boasts a vintage check pattern. There’s also the “Giles” and “Fabian” outfits by Simon Templar for your consideration. 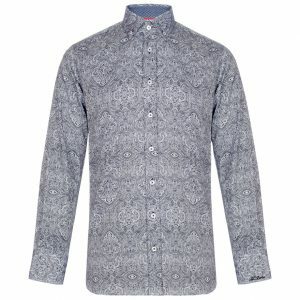 You’ll obviously need a smart casual shirt to do justice to the above outfit! That’s where Jiggler Lord Berlue comes in. 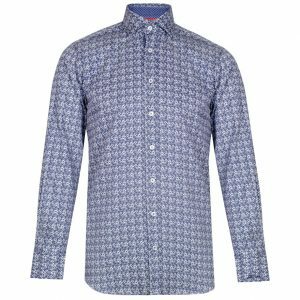 Here are two AW17 season stunners for your consideration; the “Rush” (left) boasts a stunning Paisley print with superbly detailed patterns, as well as a smart button-down collar, mitred cuffs and a stylish polka-dot lining under the placket and collar. The “Oliston” (below) goes for a more quirky vibe with a stunning all-over floral pattern. Both are outstanding additions to any discerning gent’s wardrobe. The fit is slightly “tailored” as usual and sizes range from Medium up to XXXLarge . 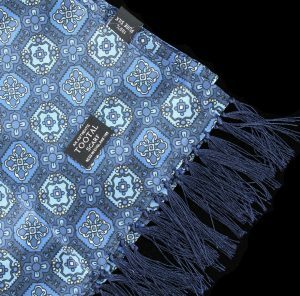 Tootal scarves are a legendary British brand with serious Mod heritage. Their basic style hasn’t changed — high quality silk scarves with memorable patterns. We’re proud to offer six new Tootal scarves for AW17 season, including a classic “tile print” in Blue (left) and a mustard-colour “circle print” scarf (below). 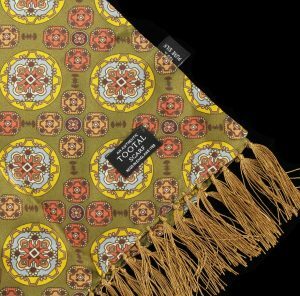 Browse the full Tootal range here. Remember — you can claim 10% off all AW17 season gear with the code OUTFIT17 — just whack it in at online checkout!